The Stairmaster is a great tool for cardio, but climbing a never-ending staircase with no view can be boring as hell. If you're suffering from stair-machine burnout, take a break! 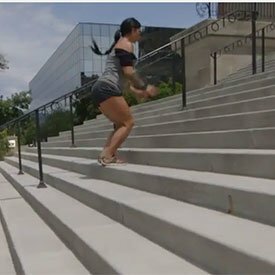 My Sucking-Wind Workout will get you out of the gym, into the sunshine, and up some real stairs. You can incorporate this cardio workout into your routine when the weather is nice, but I think exercising outdoors, even if it's a little chilly, beats a dirty exercise machine in a smelly gym any day. 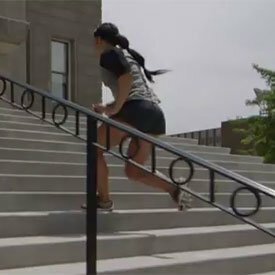 The best thing about this workout is that you only need a pair of running shoes and a nice, wide set of stairs. If you live in the city, you probably have a flight of stairs nearby that will work. For instance, I used the steps of the state capitol building. The workout consists of five different exercises, done for 10 sets of about 50 feet each. It's tough, but it's going to challenge your cardiovascular endurance, your balance, and your coordination. So, it's not only great for overall conditioning, but also for overall fitness! Stand at the bottom of the stairs and drop immediately into a push-up, resting your hands several steps up. After the push-up, jump your feet all the way up to the step right below your hands, keeping your feet together. Repeat this until you get to the top of the stairs. When you get to the top of the stairs, that's one set. Run back down to the bottom and repeat 9 more times. This could easily be called the bunny hop! Jump up two steps at a time with your feet together, landing on every other step. Don't be afraid to use your arms to give yourself a bit of momentum. Run down to the bottom of the steps and repeat 9 more times. Face sideways and put the foot nearest to the staircase on the first step. Then, cross the lower foot over the upper foot so it lands on the stair above. From there, step the bottom foot to the stair above the top foot. On your next step, instead of moving your bottom foot over your top foot, cross it behind the top foot so it lands on the step above. Do 5 sets facing to the right, and 5 facing to the left. Alternate crossing your back foot over and behind the lead foot. The grapevine is a little more technical than the other exercises we're doing in this workout, so you may want to take it slow and practice the move on flat ground first. Stand on your right foot and bend your left leg so your left foot dangles around midcalf. Swing your arms and hop up the stairs. 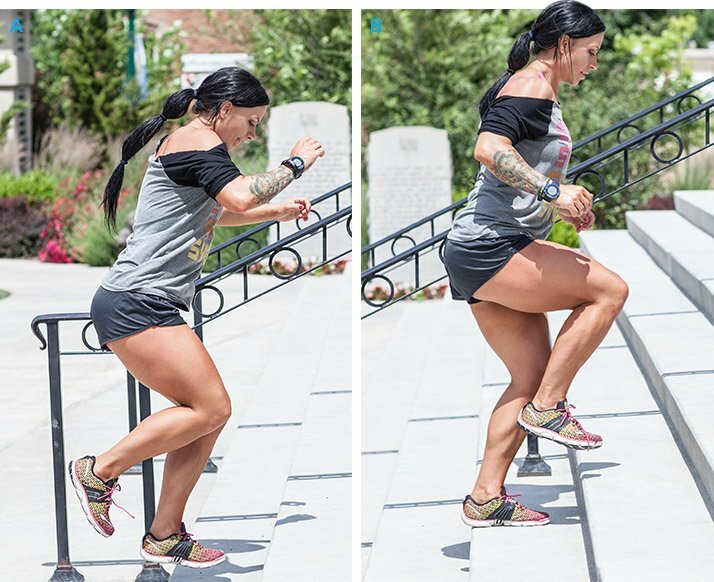 Switch legs each time you hop up the stairs. You'll really feel these in your calves, so I recommend stretching ahead of time. Try to get up the steps as quickly as you can. Bounding sprints are surprisingly fun! All you have to do is sprint up the stairs as fast as you can, taking the steps 3-4 at a time. This is a great finisher exercise because you're really elevating your heart rate and pushing your whole body to the max. You have the workout, now all you need is a set of stairs and the right attitude. You may have to do this workout in public, but don't let it bother you. Anyone who sees you will have no choice but to think, "What a badass!"